weekdays and weekend left in May and June. Last year the coho's ran thru the beginning of July but the best was May and June. So reserve your date soon... and ...Good fishing! Well February is here and it's time for the Tinley park fishing show. Youth ages 6-13: $5 Kids: 6 & under FREE! Here are the shows for 2019 Don't forget to mark the dates on your calendar. I will be at the All Canada show and the Muskie show in January at Chauncey's Great Outdoors booth. Stop By and say hi!. Here are the shows for 2019 I have a Booth at. I will be at the Schaumburg fishing show on January 24th, thru 27th. From Diamond Ghost Charters to you. New tent camp on the world famous Nushagak River! The end of June is approaching fast that means that the King Salmon are starting to show up in my area of lake Michigan which is North Point Marina in Winthrop Harbor Illinois. So far my biggest is 22lbs now that's a trophy fish. Great fight excellent to eat. Limit of COHO SALMON with bonus King salmon and Rainbow trout and Lake trout. Deep water fishing offshore in 200 feet of water the best of Blue Water Fishing. It's been a long winter and the weather has been perry cold bow now is the time to think of the big pond Lake Michigan with the best salmon fishing in the united states. Now is the time to make your reservations for the trip of a life time to catch the best eating fish ever coho salmon and Steelhead the spring run starts in May and run thru June. Lake Michigan Salmon Fishing Salmon Charters 2 or 4 Person Weekday Specials. We are a Fishing Destination for Lake Michigan Salmon & Trout for a day of great fun. Vacation Packages for Salmon, Trout fishing 7 days a week , All tackle is Furnished. I will be at the Bass pro shop in Bolingbrook, ILL on February 24th & 25th please stop by to say hi and book your 2018 salmon fishing trip. Book your May & June is the spring Coho salmon run. October bring great fishing for trout and a few salmon but the trick is getting out onto the lake with the start of are gale wind on Lake Michigan it is hit or miss to go fishing. Our season has come to an end and the marine is closed now until April 2018. See you next year for the spring coho salmon run in May. Hook And Vice Legends is a documentary short film series featuring the legends of fly fishing in British Columbia and beyond. Our premier doc features Vancouver Island based professional fly tyer and long time fly fisherman Art Limber. Art is as Canadian as it gets and his humour, grit and dedication to craftsmanship above all else make this a great watch for all who love fishing. July is the time of transition from smaller fish to fish that are line screamers, But as July rolls in we are still catching coho salmon with shoulders they're ranging from 5lbs to 8lbs this is incredible to evan see coho's in July. The King salmon and Rainbow Trout AKA (Steelhead) are starting to show up with the water temp starting to clime in to the mid 50's. July thru early September we will be seeing some real nice King salmon and a verity of different spices. Right now the coho's are in full swing and they are jumping into the boat. Fast action fantastic fun time to fill your freezer with salmon. Great to grill. Fish Monday - Saturday . arrive back in Anchorage 5 PM. for your flight home. If you are interested in fishing the Alaskan Wilderness for unbelievable fishing , sightseeing Bear moose eagles otter beavers . This is the trip for you at the right price. I need a 50% deposit and the balance is due 60 days prior to your trip. Note: Optional Halibut Saltwater trip can be added either before or after the trip also hunting for Moose,Black & Brown Bear Hunts can be added. King Salmon Season Begins June 4 at Jimmie Jack's Lodge! A short and sweet review I did on the new Airflo Scout Heads. 68 Pound Kenai River king salmon! This summer was a great one at Jimmie Jack's Alaska Lodges. We caught giant fish, had some wonderful guests, and purchased a 5-star property. We are here on the banks of the world famous Kenai river at the end of the summer fishing season of 2016. We had a great summer and did a lot of exciting things that we’d like to share with you today. We had the privilege to be featured again on Channel 2 KTUU, one of our local channels out here. They came out on the boat with us and caught some massive silver salmon, among other fish. NFL legend Larry Csonka and his former teammate Norm Evans joined us for a trip. They had a great time out there on the water. Looking back, we had an incredible summer and now look forward to an exciting new future here at Jimmie Jack's! We caught a lot of Lingcod and Yelloweye Rockfish this summer, as well as the largest halibut caught out of Ninilchik. It was 345 pounds and caught by our Seascape guest John. The fight was impressive, but with the help of Captain Charlie Barberini and his deckhand, Cooper, they were able to wrangle it into the boat. Watch the exciting capture in the video above. Outside of fishing, the biggest highlight of the season is that we acquired the Alaska Seascape Lodge, which allows our guests to experience the ruggedness of Alaska with the amenities of a 5-Star property. The water level has been dropping, it’s getting cooler, and we are just getting in some last-minute fishing before the colder months come. If you have any questions for us or if you’re already looking ahead to plan your trip for next year, give us a call or send us an email. We look forward to hearing from you. Halibut fishing has been steady with catches coming in from 20-70 pounds. We have lots of great tides coming up in November and December. Winter Chinook fishing is on fire with lots of fish from 6-12 pounds and some bigger 12-16 pound range coming in. We will be available all winter long. Rolf and Peter spent all summer filming a new documentary film on Kamchatka. The film highlights some of the major threats to the most intact Pacific salmon eco-systems left in the world. Hint: fly fishing can be a part of the solution. A short version of the film will be out on the Flyfishing Film Tour in 2017. To be a good angler, you've got to be a bit of a scientist. You're always making observations. River conditions, weather patterns, bug life, and fish behavior all play into your ability to catch fish. Science also goes a long way to protect the resources we've damaged through the altering of natural processes like river flooding. The miles and miles of canals built to help irrigate California's Central Valley have systematically reduced salmon habitat and the landscapes that salmon fry once used for packing on weight before heading to the Pacific Ocean. California Trout has invested in some really interesting science and is coming up with unique solutions to complex ecological problems. The Nigiri Project they're working on is turning salmon fry into flood plain fatties! 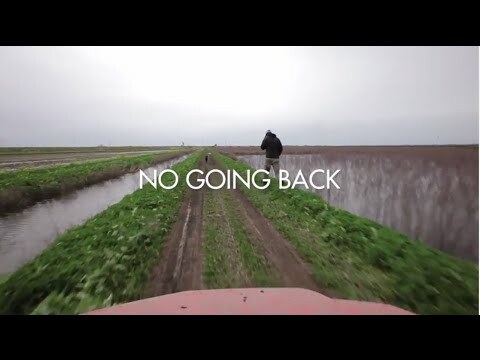 Check out their latest video, No Going Back, to find out more about the science behind fattening up salmon fry before they head to the delta (hopefully avoiding striped bass) and eventually under the Golden Gate Bridge. The Amberjack crew took a trip up to the famed Salmon River in upstate New York to swing some flies for steelhead. I have been catching a lot of Lake Trout in the 8lb to 20lb class it is amazing the numbers of Lake trout caught. Now these trout fight you like giant habit coming up from the deep what a fight. Also starting to catch more salmon in the mix some king salmon are showing up in this late season of fishing for October. Our harbor is going to be shutting down for the winter at the end of the month that will be all the reports for Lake Michigan. But I will be posting Ice fishing reports on the surrounding areas of northern Illinois and the Chain O Lakes Area. When we traveled to British Columbia last year, we went fishing for Steelhead with François Blanchet. On the banks of the Skeena system, Franky told us about his most recent summer thrill: catching pacific salmon with a fly rod in the open sea. When the opportunity to visit BC once again came upon us this year. We jumped at the chance to reconnect with Frank. He was working with Dave, the owner of Sunset Charters. One quick phone call is all it took for us to arrange a trip the first week of august. The Coho would be in full force, meanwhile the opportunity to catch a Chinook in the salt still lingered. As the plane came in for its final approach of Digby Island, we caught glimpse of what was awaiting us for the first time: a labyrinth of islands surrounded by crystal blue water and the stunning coastal mountain range. Frank was waiting for us at the ferry dock. It was good to see him. We quickly loaded up our gear on his boat and got on our way to the Prince Rupert docks.We tanked up the boat and filled several additional jerry cans, which gave us our first indication of the scale of the trip to come. On that evening, Dave met us at the docks. As we’d discussed, the plan for the week was to head way out of Prince Rupert into Chatham Sound and travel between the Islands in search of feeding fish, bait balls or promising currents. The sun was barely touching the horizon when we left the docks the next day. We had two boats: Franky and us on one, Dave with his wife Sophie and her friend Jamie on the other. After cruising for a couple hours in the incredible sceneries of the North-West British-Columbia coast, we arrived in the inlet where we would set our basecamp for the week. We broke out the rods and reels, tested the gear and got ready for action. We had seen a couple bait balls on our way in which caught us off guard. We did our best to make the most of the opportunity and readied ourselves for the next ones. As we moved from bay to bay, Franky explained us how he fished the ocean in a similar manner to how he fishes a river. Looking for currents, rocks and tidal effects that would bring the fish in specific areas. After seeing how efficient he was on a steelhead river, we knew we were in for a great week.Over the next days, we tried to apply what Franky had taught us. Fishing between inlets and on kelp patches. We began to gain confidence in our newly discovered techniques. Soon after we started spotting schools of Coho, at first they were far beyond our casting capabilities. Thrashing on the surface feeding in schools. It seemed almost impossible until Franky drifted boat perfectly along the ocean currents, as we drifted into a school of bait a dozen fish rose around our fly at the surface. It was incredible to fish for salmon in such an environment. As we were mostly Atlantic Salmon fishermen, having the opportunity to throw a fly at a feeding school of wild salmon in the middle of the ocean with pods of orcas and seals splashing around was a ridiculously different experience. Back at camp we ate like kings, feasting on the fresh crabs and shrimps Dave had caught in his cages earlier that day. If you thought the twelve garlic shrimps for $10.99 Thursday deal at your local seafood restaurant was the best you’d ever seen, you would surely have to reconsider. Thanks to Captain Dave Eng and to François Blanchet from Sunset Charters for the amazing experience and for bringing us on this adventure. We’d also like to thank Destination British Columbia, Fishing BC and Destination Canada for making this project possible for us. For anybody with a desire to live a similar experience, contact Dave and Frank at info@sunsetcharters.ca, we highly recommend the trip! It's a divided world out there. We need the outdoors to keep us centered. This time of year I see a lot of Lake Trout migrating thru our area with the bonus fish being smaller king salmon with a few coho's in the mix. October is a go fish or no go fish kind of month do to our high winds and high waves we get this time of year. We call this the gales of October. I have been fishing offshore this time of year from 5 to 9 miles out fishing down-riggers 130 feet down to 180 feet down for these big monster Trout. Alaska's seemingly inexhaustible supply of public lands make it among the best place in the world to hunt and fish. Keeping that land in public hands will keep Alaska wild and accessible to anglers and hunters for generations to come. With a landmark agreement in place to remove dams from the Klamath River, California's signature salmon and steelhead river is well on its way toward recovery. But it took decades—and compromised from all involved—to achieve this outcome. Most people don't think of South America when they think salmon fishing, but the Chinook population is there - and it's booming. Right now is the best time for the lake trout migration thru our area, these monster trout are some of the best smoked and deep fried tasty morsels you will ever eat. Fishing in deep water sending lures down 130 to 180 feet down to catch these deep cold water predators is a fight like no other fish. I have been running white tails in front of a green and white spin n glow on a 32 inch leader with a white hot spot magnum dodger works the best. We are still catching a few King salmon and Coho salmon in our mixed bag of fish. The Lake fishing isn't over! As many people are starting to put their boats away salmon fishing continues to be great. Salmon I've been found and 64 to 48° temperatures the best methods for taking these kings are flasher flies, J plugs, & cut bait rigs. There are still plenty of salmon in the leg caught by troller's before they enter the rivers for their fall spawn. So if you're still looking to do some open water trolling now is your chance. Bogachiel and Calawah rivers have good numbers of hatchery steelhead, the Sol Duc has excellent numbers of Coho and the Hoh river has been hit or miss for Steelhead since the opening September 1st with rain coloring up the river. River flows around Forks,WA are much better since this weeks rain bumped up most river 6" to 12". So with low expected returns of coho for the great Puget Sound, fishing was open or not open based on timing and which region of the Sound you were or are in. With this however sea run cutthroat fishing remains open and has been quite productive as of late and for those staying deep with their flies, a few surprises in form of resident chinook (blackmouth) have come to hand which are always a blast by fighting harder per square inch than any other fish in the Sound. Reaching into September, most of us begin to get excited about the SRC fishing again as water temps begin to cool, kelp dissipates, the sun stays a bit lower in the sky and the weather sneaks up on us again. All good things for those fly fishing in Puget Sound for cutthroat. By now, baitfish have become larger on the journey out of the Sound so fishing longer baitfish patterns will take care of representing the baitfish situation for you but don't for a minute think that the SRC's or coho who have returned won't hard charge your surface fly out there so go for it. We still have some big tides coming up but daylight is becoming more scarce so start paying attention. We are always happy to help those who wander become a bit more focused when it comes to the Sound so just let us know. This has been one of the best years ever for Rainbow trout on every trip I have caught Rainbows they are tail walking line ripping fish that put up a great fight. The big fish this week was a 14lb Rainbow now that's a fish. I also have been catching Kings and Coho salmon with some monster Lake trout, I fish out of North Point Marina on Lake Michigan that offers a a wide verity of spices for the dinner table. The fish have move off shore to about 150 feet to 280 feet of water for the best of blue water fishing. The best baits to use are still dodgers and flies on down-riggers down 40 to 150 feet down and dipsy divers 65 to 90 feet on the line counters. Lead core still working 10, 8, 6 and 3 color leads are all working with a mix of spoons. Ontario offers some of Canada’s most incredible Steelhead fisheries, people come from all over to fish the great lakes for these most sought after fish. Most tributaries here in Ontario are not the biggest, but some are comparable to rivers out in British Columbia. And since Steelhead season is not far away, I want to go though some proper etiquette. The first point I can give beginner or novice angler(s) is how to correctly approach a run that may have been just vacated by another angler. There are usually a few options you have depending on the size of the run you plan to fish. When first approaching the run, especially on a river that is heavily fished on a daily basis during the season, scan the run from the top to the bottom for other anglers. If there is nobody in the run, I would recommend starting at the top and working your way down like you would normally fish a run, but if there is an angler working the stretch, watch and observe for a short period of time. If the angler is moving as he or she should, not hop in below. If the angler is not moving, observe for a short period of time and see how they are covering the water. When dealing with a large run, it might be possible to fish below the angler, but always ask before you do that as some people don’t like it. If you just walk in from coming from the car and start to fish below somebody without asking, that is terrible etiquette. If you think the run is big enough to fish below somebody when you just came to the water again, always ask to fish below. The worst case, they will say no and if not, they just might say yes. Regardless of what happens, you and your buddy will know that the proper steps were taken, and are much less likely to stir up a conflict on the water. Along with standard etiquette comes with participating in proper fish handling and releasing skills. For quick photos and releasing of Steelhead, it is always necessary to put yourself in a position of landing the fish without causing any harm or damage to the fish. If you desire a photo fish your catch, make sure the person taking the photo is setup and ready to shoot before you remove the fish from the water. The fish should not be out of the water for more than a couple of seconds better if not all. If you are having a hard time and struggling with the fish, it is always a better idea to keep the fish in the water and take a photo that way before you plan to release it back into the current. So the next time you plan to venture out the river, practice your etiquette and help a fellow angler out that may be new to the sport or tributary, or may not know correct etiquette. If you happen to find yourself having an issue with another person on the river, it is always a better idea to educate them or maybe they will educate you rather than to start a confrontation. There’s been days where I have seen people yelling at each other about not having proper respect for the fish in handing and or releasing as well with not having the proper etiquette of respecting each other on the river. Every year more and more people are coming out to fish these amazing fish and at the end of the day can’t we all just get along for future generations to enjoy this beauty. The fishing has improved for King salmon on Lake Michigan on the Illinois side of the big pond. The kings are starting there staging run looking for the harbors and rivers they where released in to head back into and spawn. The bite has been pre-dawn to till early morning, They are biting white hot spot flashers and pearl flies, green flashers with green/pearl flies for kings and a mixture of spoon on 10, 8 and 6 color lead cores for Rainbow Trout. Bonus fish are some coho's and Lake Trout. Fishing has been fantastic with the fish hanging on the bait we are catching Chinook and Coho salmon and Rainbow trout with a few lake Trout. The fish are ranging for 5 pounds to up to 26 pounds, my big fish for the year is a 26lb King salmon wow what a monster. the fish are in 80 to 160 feet of water biting dodgers and flies and a verity of spoon stingers, dream weaver SS, and Sea quest spoons are work the best. good luck fishing to all. 3 fly anglers hooked 6 chinooks today and managed to land one at the final buzzer! Watched fish roll all day and a bunch of jacks rising all the time at the top of the pool. We saw some roll over 40 pounds and had a few in the 20s on the line before they popped off. Steelhead are coming in early this year, with the numbers at the test net on the Skeena at four times they're normal number for this time of year. Hopefully we find some. 4 more days to go with Nicholas Dean in Terrace, BC! Lake Michigan's Huge King Salmon fighting like (AKA) fresh water Tuna ? We are starting to catch a variety of king salmon, cohos, and rainbow trout right now. The best baits are hot spot dodgers whiter with white flies, and a mix of spoons. We have cold water in front of our marina and it's 56 degrees and out side of our hills it is 62 degrees so I have been fishing temp breaks and that's where the fish are 60 feet to 120 feet of water.